If you need to repair a leaking roof on your home in the Collinsville, Illinois area, let Daech & Bauer Roofing provide you with the service and peace of mind you deserve. We’ve successfully completed more than 10,000 projects in the area, and we back our work with a standard five-year labor warranty. 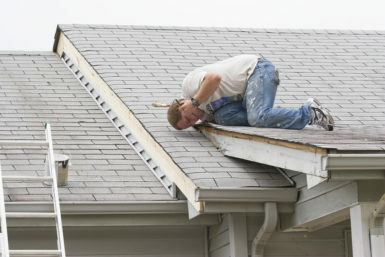 We can repair all types of roofing, including energy-efficient shingles, cedar shakes, metal, tile, and slate, and we have a technician on call 24 hours a day in case emergency repairs are needed. Once your claim has been paid, our roofing technicians will return your roof to optimal condition using the level of craftsmanship that helped us earn the Home Builders Association Remodeler of Distinction award on six occasions. Whether you need to repair a leaking roof or want to inquire about a complete roof replacement project for your home in the Collinsville, IL area, contact Daech & Bauer Roofing today. We would be happy to answer any questions you have. Very nice, job well done. Very happy I'd give you a five all the way!